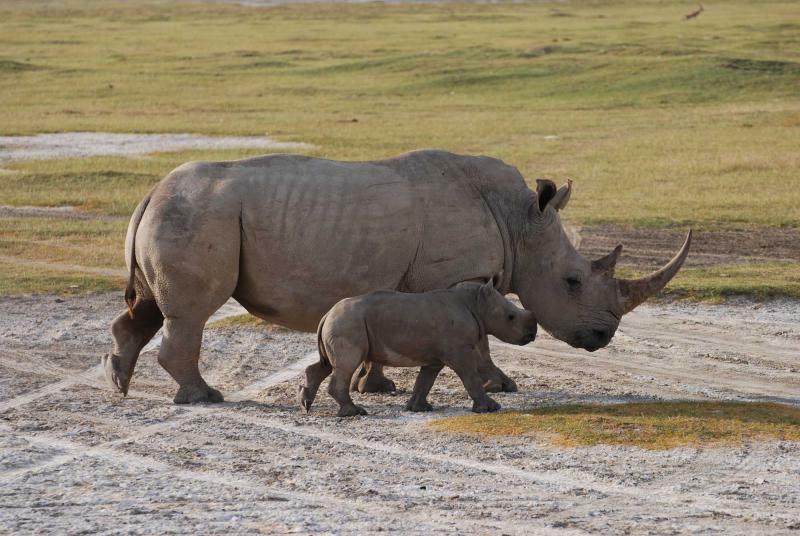 Safari means to journey. 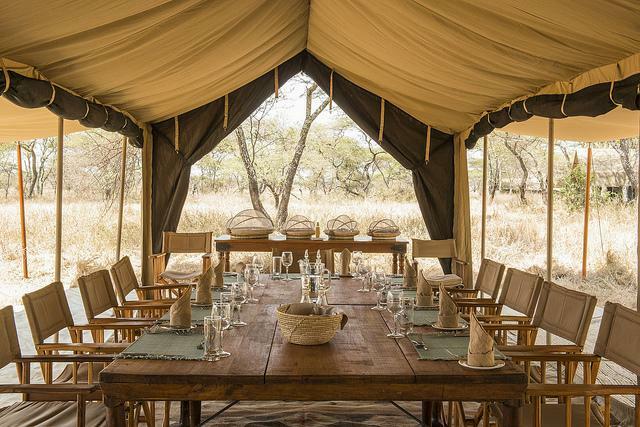 Experience the journey as you start your lives as newlyweds and experience the dense wildlife of Tanzania, where black rhinoceros graze the land, lions laze in the grass, and the sweet sound of vibrant birds drift through the sky. Let the journey be the destination and learn what Mambo Poa (cool stuff) and safari mean beyond their definitions in your unforgettable honeymoon in Tanzania. 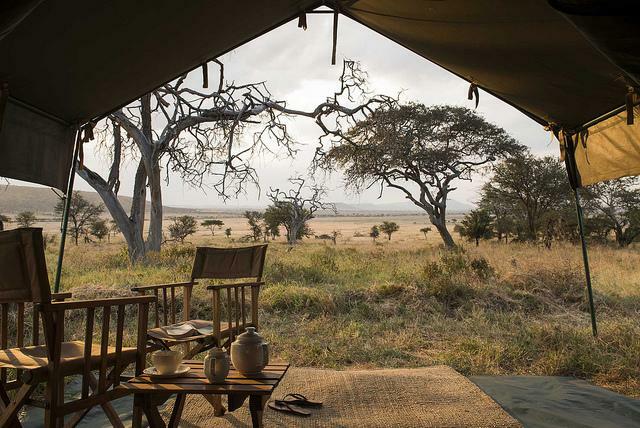 Dive deep into your own private journey on this exceptional 6-day Tanzania safari. Whether in the dry season of Tanzania’s winter months or the wet season of the summer, this exclusive tour will show you the true meaning of safari, where there is more to a destination than just being there, where there is always more to see, more to explore, and more to experience. 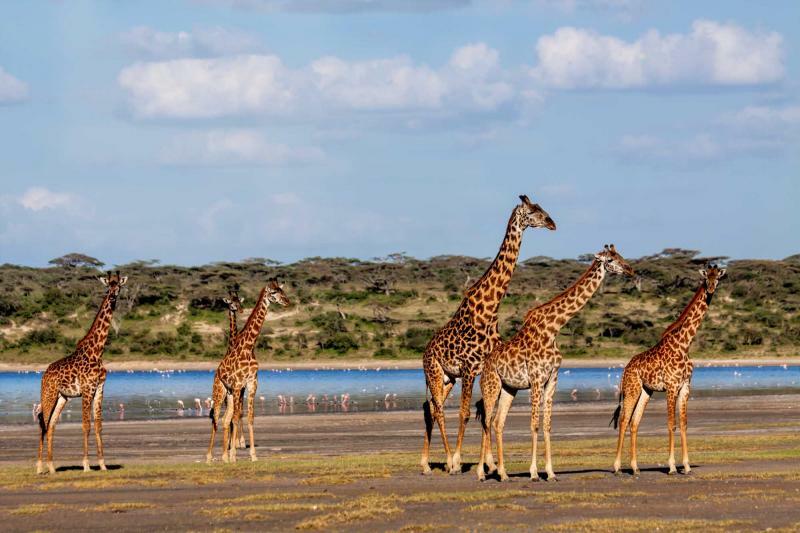 Leave from your luxurious and intimate accommodation in Arusha and prepare yourself to travel through the depths of East Africa, where the wildlife lingers in the people’s hearts and minds, and has captivated our imaginations for generations. 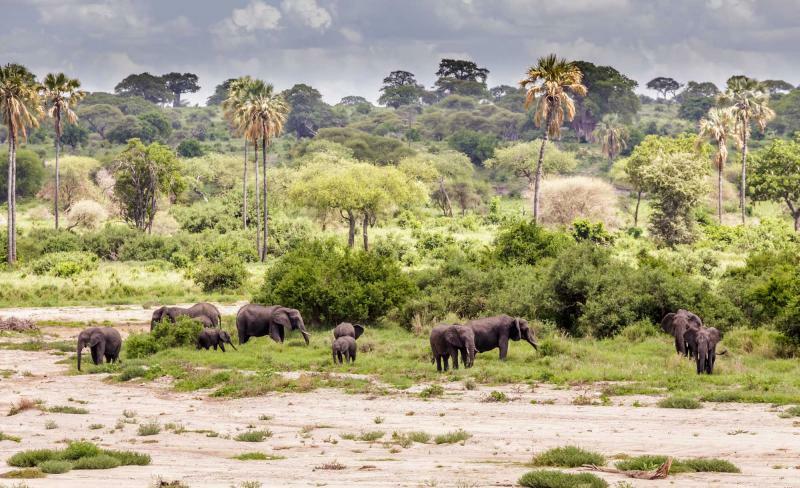 Travel to Tarangire National Park where the river feeds the land and animals all year round and keeps the park lush and brimming with wildlife. 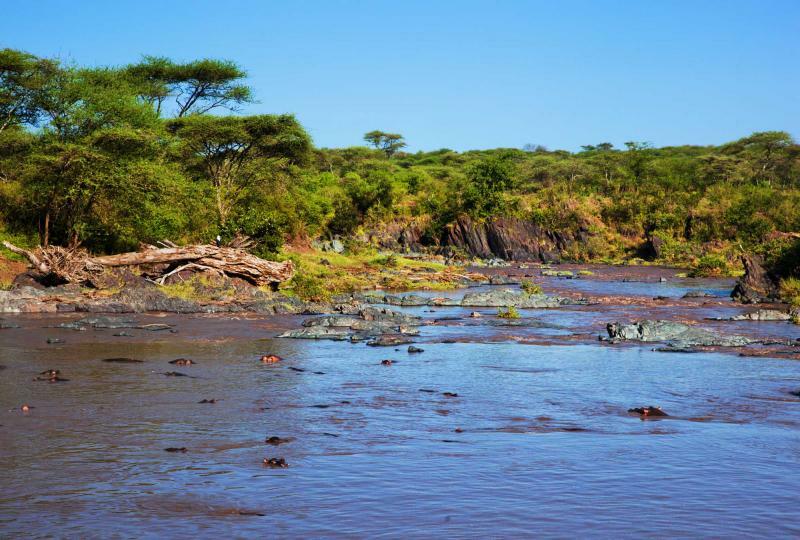 The smell of wet earth constantly filling the air as generous amounts of antelope, elephants, and lions decorate the riverbanks and stand along the rushing water’s edge. The Serengeti has you journey through the endless plains of historical magnitude, known throughout the world as an incredible site to view the natural life of East Africa, from jackal to serval, the Big Five to aardvarks, and continues on to the Olduvai Gorge where humanity’s history unfolds itself to anyone and everyone willing to visit. 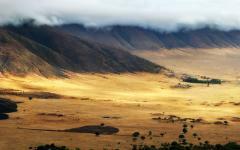 The romantic journey continues with a visit to Ngorongoro Crater and the abundance of life that calls the crater floor home. The clouds part daily, burned away by the golden sun that pokes holes into the overcast sky like Swiss cheese and shines light onto the consistent greenery. Return to Arusha and traverse the grounds of Arusha National Park, both on foot and by vehicle, and wander through the incredible forest and exceptional fauna, all while Kilimanjaro watches over you from above. The beauty of Africa sings in the morning with the sunrise and in the evening with the sunset. The light of the stars drifts across the sky, illuminating the night and shining down on the nocturnal wildlife. Whether day or night, Tanzania will keep your sense of adventure thriving and your interest peaked as you make your way through the stunning landscape and vivacious wildlife. 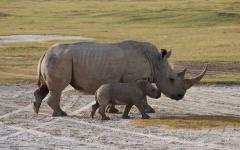 Your journey through Africa comes to an eventual end, but the safari never will. Begin your honeymoon with an abundant breakfast of decadent fruits and rich African coffee. The smell of dark roasted coffee beans mixes with notes of lemon and honey drifting from your morning cup until you’re ready to leave Arusha and make your way to Tarangire. Incredibly drenched in the wet season from the raised water of the Tarangire River, explore the area in the dry season, when the river shrivels to a shadow of its wet-seasoned self and when the wildlife will travel through the golden grass to the riverbanks in search of thirst-quenching refreshment. The trees huddle over the riverbanks, their roots sprawling from underground trying to soak up the moisture that the river provides. The leaves and branches sway in the warm breeze; the raucous sounds of thirsty animals surround the riverbank as the animals make their tired way to the river for a drink. The smell of dry earth fills the air. 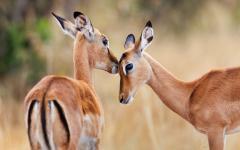 The large spiraled horns of impala stretch above the tall grass. 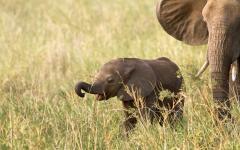 Their light brown coats blend into the foliage as they graze, their heads lifting now and again to survey the area. When their heads raise, their bodies freeze and their ears begin to twitch, something has caught their attention. Although that something may be you, watch in silence and wait, listening to the sound of rustling grass, birds singing in the distance, because every once in a while the impalas spring into action, able to leap as high as ten-feet into the air, jumping over any predator that might try to pounce in the dense grass. 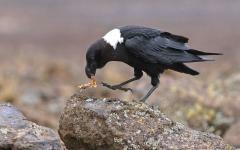 Enjoy an early morning breakfast before departing Tarangire for the fabulous Serengeti National Park. Accept the wishes of “Safari Ya Salama,” as the locals wish you a safe journey, a farewell similar to that of “Bon Voyage,” as you head deep into the endless plains of the famous national park. 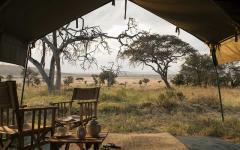 Acacia trees decorate the plains intermittently while filling the park with a sweet scent that drifts across the plain. The sweet aroma teases many herbivores, enticing them to taste the acacia; however, the thorns of the trees keep most animals from being able to delight in the sweet smelling vegetation. Giraffes’ long necks extend to reach to the tops of acacia trees, grabbing onto the delicious brush that other animals are unable to reach. Their large eyelids droop giving them a tired, lazy look. Their spotted pelts can blend easily into the trees as their dark tongues, strong and impervious to the trees’ thorns, wrap around the acacia branch and pull the brush away. They push aside much of the unwanted brush with their lips. 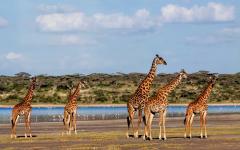 Recently scientists have come to believe that giraffes’ tongues are dark to help protect it from the sun during their constant grazing and to prevent melanoma. Watch how the giraffes sway when they walk, using one side of their legs to propel themselves forward, relating them closely in stride to camels. As the sun sets and the giraffes search for a safe area to linger in the night, their silhouettes bounce in the deep red of the sunset where they tower over the plains, the tallest and most beautiful being seen in every direction. Wake up to the deep caw of the Hamerkop; an African word meaning “hammer-head,” in reference to a brown hammer-headed bird with a dark black beak. 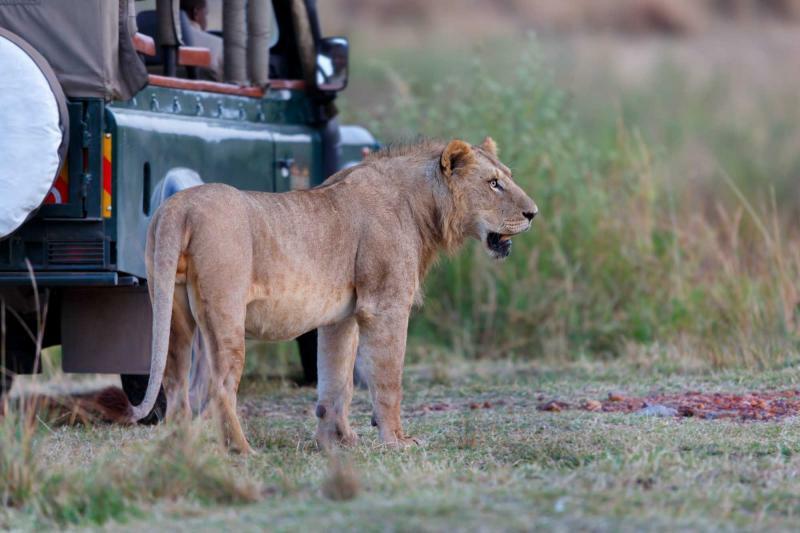 Respond to your guide’s early morning greeting exclaiming your excitement to continue deeper into the Serengeti because the previous day had been so enthralling. “Mambo Poa,” you say, meaning “Cool Stuff!” Indulge in a luxurious breakfast, the rich, sweet smell of Tanzanian roasted coffee helping urge you forward before you make your way to the northern plains of the Serengeti. 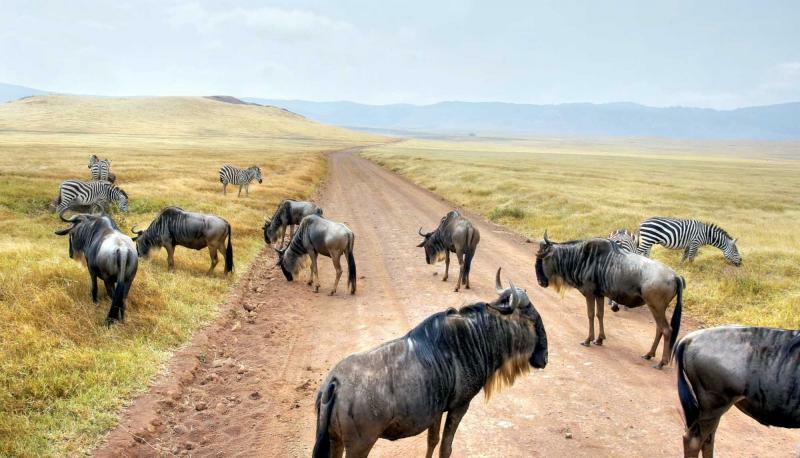 The northern territory of the Serengeti is chock-full of wildebeest during the Great Migration, their heavy hoofs fall onto the drying ground, dust clouds lift into the air, and the constant beating of their bodies keeps time with the galloping herd until they reach the Mara River. 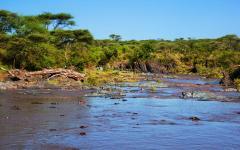 The river snakes through Tanzania and Kenya giving the wildebeest a constant obstacle during their migration season. 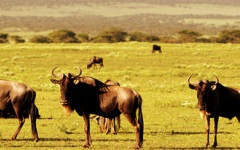 When the river is high the wildebeest are often taken with the current. 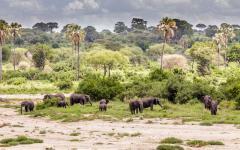 When the river is low the animals have to fend off the crocodiles that call the Mara home. 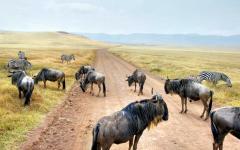 However, during the Great Migration, the wildebeest are never deterred and always manage to find a way across the Mara. Unlike the dried southern territory, the northern territory contains remnants of lush grass and plant life no matter the season. The river’s banks shrink but the water continues to run, even as the wildebeest dash through the rushing current; the crashing of their legs breaking the quiet air, the smell of wet earth swirling around. 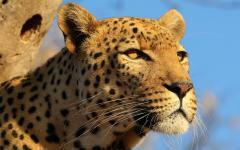 The elusive leopard is never too far away, watching the herd fumble through the river as the cat blends into a treetop. Watch for a dangling tail or paw as the prolific cat lazes secretly. The leopard is exceptionally strong, able to lift one hundred pounds of dead weight into the trees using only its jaws and, unless they have cubs, is very solitary, rarely socializing with other leopards unless mating. Hidden deep in the canopy, if you don’t look carefully you may never even know that they are there. 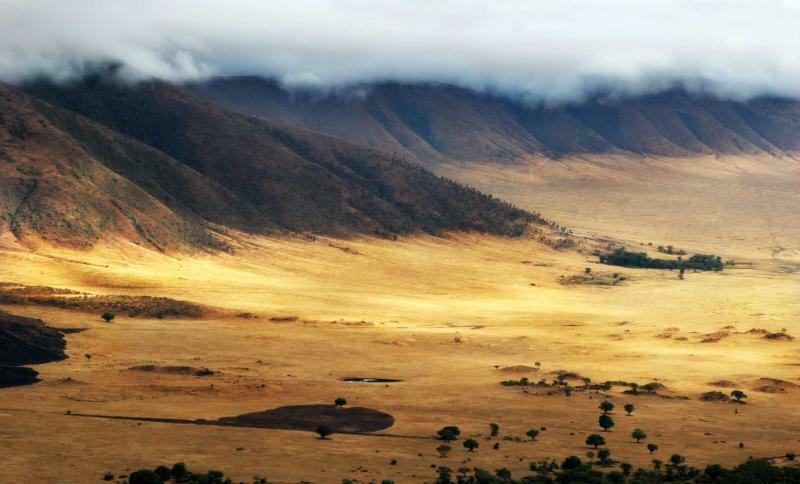 On the fourth day of your Tanzania honeymoon, leave the endless plains behind and make your way to the Ngorongoro Crater. 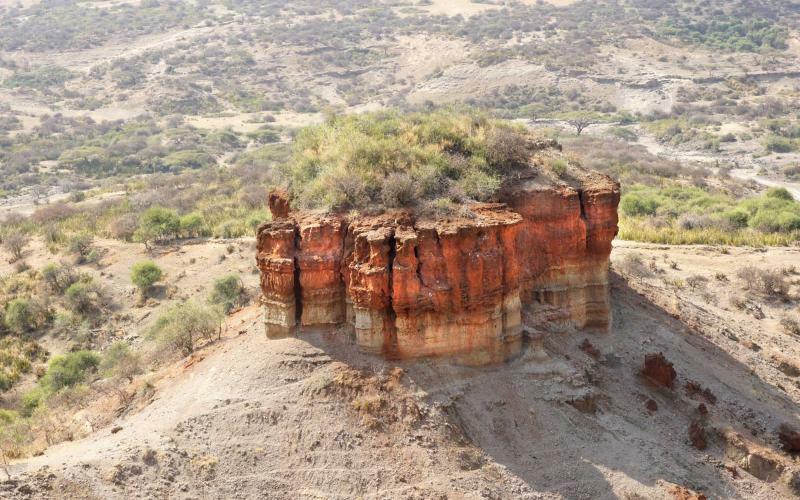 Stop along the way to visit the incredible Olduvai Gorge. The museum located here is filled with fossils, including those of human remains dating back millions of years, giving the gorge the local name: “Cradle of Life.” Wander through the museum and experience the pieces of history that have come to light over the decades of discovery in Olduvai, including the Homo habilis’s possible broad ranged diet, including leaves and woody plants. You can try to connect the dots of human evolution, tracking the migration of our ancestors over time, from Olduvai Gorge upward into North Africa, and beyond. 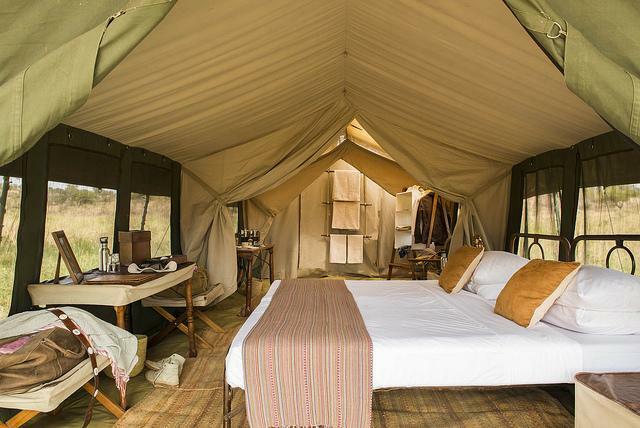 Continue on to your beautiful accommodation around the Ngorongoro Crater where you will fall asleep to the cries of the dense wildlife; lion roars, elephant trumpets, and starling chirps, mingle with the rising moon. After breakfast descend into the crater, weaving down into the lush flora of the caldera. Lions find respite from the hot sun in the constant lavish grass of the crater’s floor, sometimes basking in the cool of the grass just off of the vehicle paths. 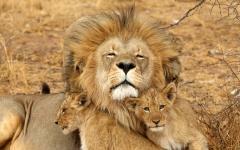 The male lion’s mane almost turns red in the sunlight, their eyes squinting in the glare. Their heavy breaths turn into occasional snorts that reach into the vehicle. 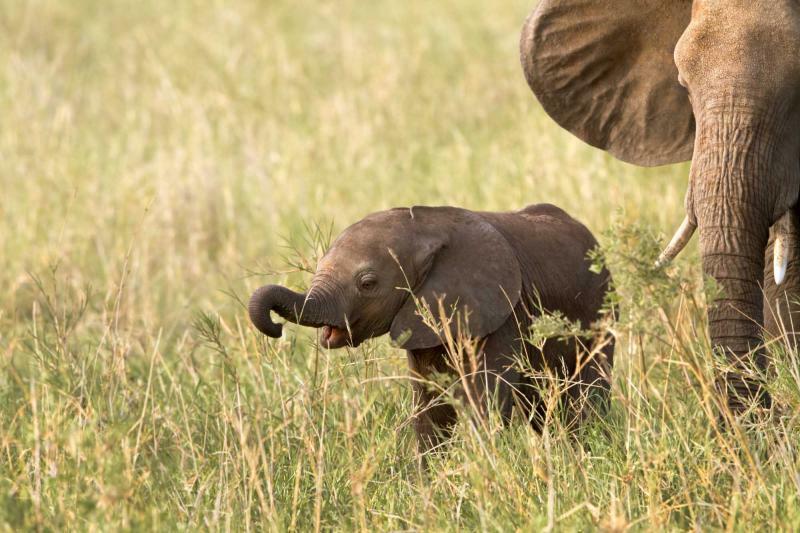 Their large noses lift and sniff the air smelling the variety of scents that surround them, including the smell of the vehicle and everyone inside. Their eyes often match the color of their fur, a golden shade that flickers in the sunlight. Their sharp teeth glisten as they yawn, roll themselves over, and let the sun warm and dry their stomachs. Sometimes they lay in the shade of the stopped vehicle searching for any respite from the sun, and spending quality time with everyone inside of the car. 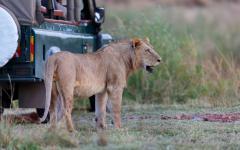 With little time and so much wildlife to see, leave the lions behind and continue on to lunch and eventually on to Arusha. 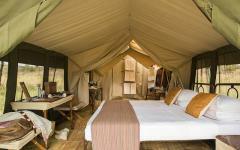 On your final day of your honeymoon, begin your day with an exceptional walking safari in Arusha National Park. Experience the adrenaline rush that accompanies an open jaunt through active wildlife territory. The turacos decorate the branches of the shadowy forest; their dark green and black feathers often blend into the dense shadows of the trees while the bright tips of their Mohawks stand tall and pop-out against their surroundings. Wander out of the trees and watch the impressive peak of Kilimanjaro rise above you. The clouds clear and the snowy peak of the tallest mountain in Africa looms large against the clear blue sky. Try to spot the klipspringers, tiny antelope that spring along rocky surfaces. Although high up on the rock face, perhaps you will see one leaping in the distance bidding you a lovely journey and a fond farewell to this romantic and unforgettable experience. After a delicious lunch you will transfer to the airport and be wished “Safari Ya Salama” once again. Each trip with Zicasso is an incredible, tailor-made journey to help you discover the beauty and majesty of any specific location. 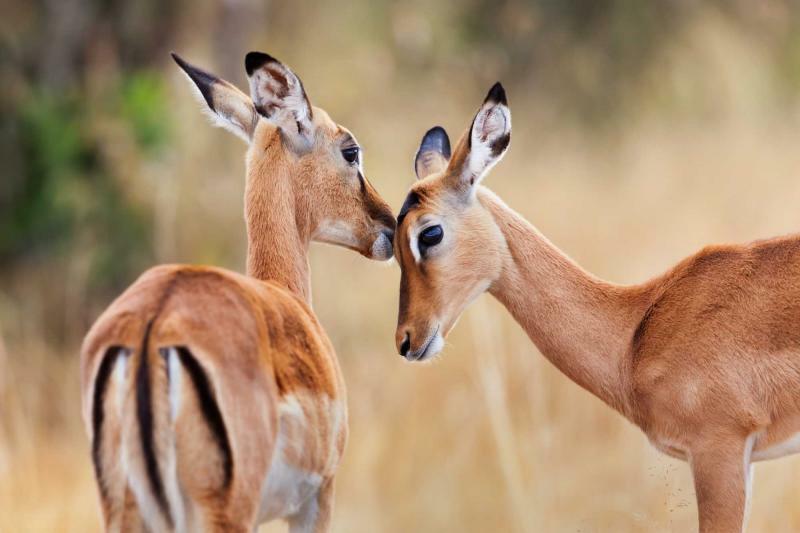 Customize your 6-day Tanzanian honeymoon safari adventure to encompass the East Africa you have always wanted to experience. 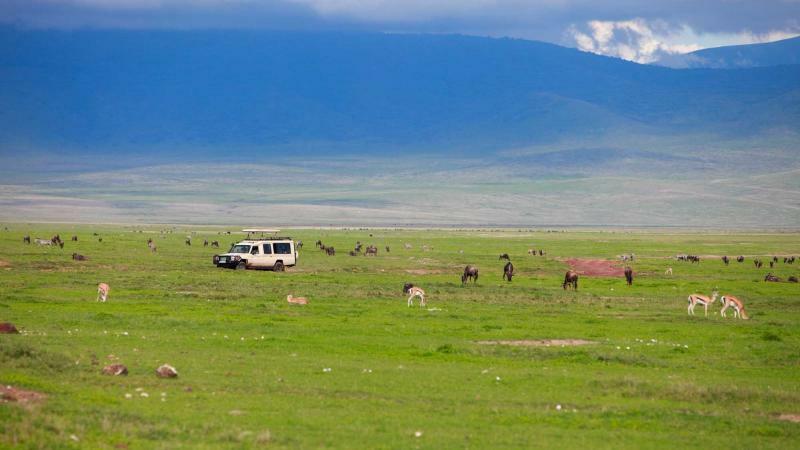 Whether exploring the Ngorongoro Crater with the park rangers or on a hot air balloon ride over the Serengeti, a representative will ensure that your adventure is customized to perfection. 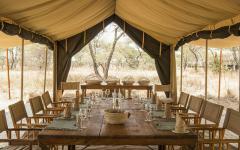 This incredible taste of Africa might even encourage you to extend your journey, and why not? Continue your adventure into the heart of Uganda to trek for gorillas, or slip into the soft sands of Mombasa, and experience more of East Africa’s incredible luxuries, whether man-made or natural. 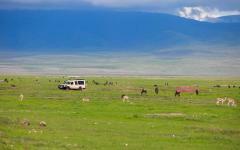 For more ideas, be sure to read the reviews for luxury safari trips to Tanzania.